Change is inevitable! It is unable to be avoided, evaded, or escaped and is certain to occur. It is unalterable most of the times. One of the only things consistent in life is change, its ebb and flow, the ups and downs, the ins and outs. Once we stop fighting against change, we can embrace it and let life flow naturally. C Change takes Courage! It is an act of bravery. It takes guts to really look at one’s life, evaluate it, and then take action to make the necessary modifications. It also takes courage for our clients to come in or call for sessions. They have done their initial evaluation of different aspects of their life they want change in, or they are plain ‘fed up’ with the consequences of the resonance of their patterns. We collaborate with them and give them the inspiration and the new resonance to experience the changes they want to see in their lives. Try it the next time you feel some resistance to communicate with someone that you know in your heart needs to happen. Watch the positive change and feel it in your body. The relief and personal accomplishment is always worth the risk! This reminds me of a quote by Erica Jong, “If you don’t risk anything, you risk even more!” I have used this form of questioning, as a modality with some of my clients and the turn around is amazing! A Attitude is paramount, and action is essential! Our attitude determines what we experience in every situation. Think about waiting in line for something. What is your attitude? Are you irritated or are you calm and perhaps reading a good novel while you are waiting? You always get what you put out. Your attitude, even when you are standing up for yourself, can either make or break the outcome. When you catch yourself being irritated, do an experiment and try different things to change it and notice what you experience. You might try breathing deeply in and out through your nose. This activates the parasympathetic nervous system for calm and relaxation. Notice what you experience, and also notice the difference in those around you. Just by changing your attitude, they change. Your attitude also makes a huge difference when you are making changes in your life. Patience is a virtue. Rome was not built overnight. There is probably a good reason things are taking longer than you thought they would. Think about the times that you looked back on other previous delays and how it all made sense over time. Breathe! Many people want to make changes but may feel overwhelmed by everything that would have to be done to make it happen. There already is not one moment to spare in their already full life. Let us take moving for example, especially when you have been in the same home for ten years. Just thinking about it feels overwhelming. I have used a wonderful process that helps with overwhelm. Let us say you want to move in six months. Get a poster board and starting on the far right side, write down the moving date. In the middle of the poster board would be three months from now, half of that would be six weeks from now, etc. and today’s date would be on the far left. Starting at the end date and moving to today, write down what would need to be accomplished by when. Soon you will see that what you actually have to do today and even this week is much more attainable that you previously thought. It is very manageable. Action is the key and being consistent will ensure your success! N New possibilities can be a by-product of change. Change can be uplifting and exciting. I love the explanation of Chaos Theory. It suggests that within the chaos of our problems or the changes we are going through, especially the ones that we did not expect or are sudden, or even seem to be out of our control, there is actually a new order – something good, better and beyond what we thought was possible. I am reminded of a country song by, Garth Brooks, “Thank God for Unanswered Prayers.” The lyrics, if I recall correctly, were about a man who was praying that his high school sweetheart would be his, which never happened. He is now with his wife, the woman beyond his dreams, better than what he ever thought possible; hence, thank God for unanswered prayers. So, the next time, change feels impossible to handle or a problem seems impossible to cope with, remember this principle and look for the new order, the unanswered prayer and you will find it! G Growth is immanent as we embrace change. It can’t not happen. The two go hand in hand. As we go with the flow and make the necessary changes as life presents us opportunities, the growth is natural. If we kick, scream, and resist change, it will kick us from behind every time. If we accept what is, we can take the next step, then the next step after that, until we have reached where the change is heading us. In the meantime, we come into our greatness. E Expansiveness is the result! As we use change to our advantage with enthusiasm, we can begin to see that change is actually necessary. 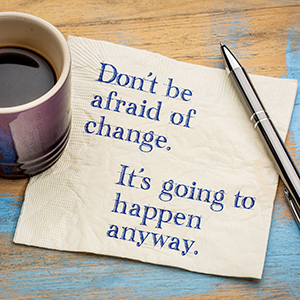 Change can now be an avenue to evolve in our consciousness–to become the people we want to become.